The scalable Colorado map on this page shows the state's major roads and highways as well as its counties and cities, including Denver, the Colorado state capital and most populous city. To display the map in full-screen mode, click or touch the full screen button. To zoom in on the Colorado state road map, click or touch the plus (+) button; to zoom out, click or touch the minus (-) button. To scroll or pan the zoomed-in map, either (1) use the scroll bars or (2) simply swipe or drag the map in any direction. (The scrolling or panning method you use will depend on your device and browser capabilities.) At any time, you can display the entire Colorado road map in a new window or print this page, including the visible portion of the map. Colorado's Interstate Highways connect its major cities and facilitate travel between Colorado and its neighboring states. From Colorado's northern border with Wyoming, I-25 travelers can drive southward through Denver, Colorado Springs, and Pueblo before leaving Colorado at its southern border with New Mexico. From Colorado's eastern border with Kansas, I-70 travelers can drive westward through Denver and Grand Junction before leaving the state at its western border with Utah. From its western terminus near Denver, I-76 travelers can drive eastward to the Nebraska border, where the road connects with I-80. Auxiliary Interstate Highways I-225 and I-270 connect I-25 and I-70 in southeast Denver and northeast Denver, respectively. In addition to these roads, Colorado's E-470 toll road loop provides easy access to Denver International Airport on the east side of Denver. 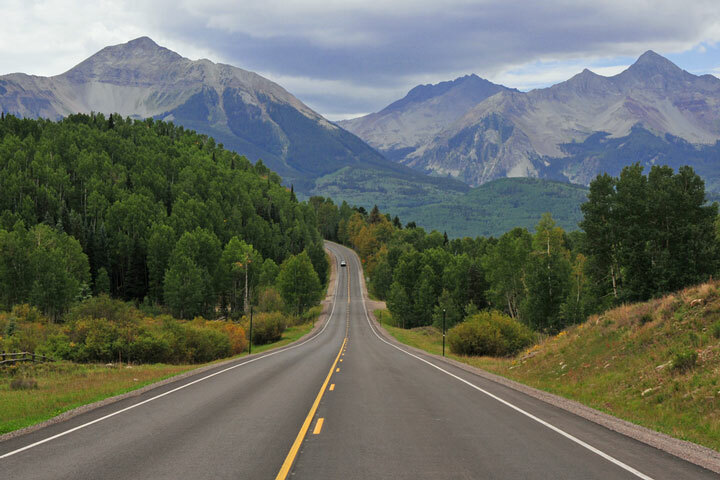 The Peak to Peak Scenic Byway is an unforgettable road trip from Roosevelt National Forest to Rocky Mountain National Park, crossing through a majestic land dotted with 1,100 peaks rising over 10,000 feet. The 220-mile Colorado Springs Loop takes visitors through Indian trailheads and prehistoric fossil beds. Not for the faint of heart, a side trip down the unpaved Shelf Road showcases the state's back country and at one point becomes nothing more than a ledge on the wall of Fourmile Canyon. More information about scenic roads in Colorado is available on the America's Byways: Colorado web page. For more information about Colorado's roads and transportation infrastructure, visit the Colorado Department of Transportation website. For Colorado road traffic conditions, visit the Federal Highway Administration's Colorado Traffic Information page.